We hope that our Metal Roof Glossary will help you understand the terms used when talking with a roofing contractor. If you have any additional questions, please do not hesitate to contact us or call us. 30 lb felt – was the standard underlayment for quality metal roofing systems and is still used but has been replaced in many areas by the newer synthetic underlayments. It is typically made of a polyester fleece and infused with tar. Architectural Roofing – is metal roofing systems that are non-weightload bearing and must be installed over solid decking rather than battens or purlins. Also called “Non-Structural Systems”. Class A, B and C Fire Ratings – Fire-resistance ratings were established for roofing per ASTM and UL tests. These indicate the resistance of a roofing system to fires originating from sources outside the building. Clip – is a small metal component used to secure two pieces of metal to each other or to secure metal shingles or standing seam to solid decking. Coatings – Below are descriptions of the available metal coatings used in the metal roofing industry. Kynar 500 and Hylar 5000 – are trade names for polyvinylidene (PVDF) paint finishes that provide very strong longevity and durability including fade and chalk resistance that leads the coatings industry. Kynar 500 is produced by Arkema Chemicals, and Hylar 5000 is produced by Solvay Solexis. Stone Coated – is metal roofing made from zinc or aluminum coated steel that is then coated with the same granules as composition shingles. It is attractive but faces similar problems of streaking, granule loss, and organic growth as traditional composition shingles. Siliconized Polyester – is a solvent-based system with polyester resin. Silicone additives are used to increase resin stability and coating flexibility. Standard polyester finishes are commonly used on agricultural metal roofs where price is of greater concern than performance. Super Polyester – is siliconized polyester with fade resistant pigmentation. The pigments enhance the performance of traditional polyesters, but the coatings are still prone to chalking as the resin breaks down over time. Plastisol – is a coating traditionally used in the siding industry. It is composed of PVC particles embedded in a plasticizer that provides some flexibility and durability. 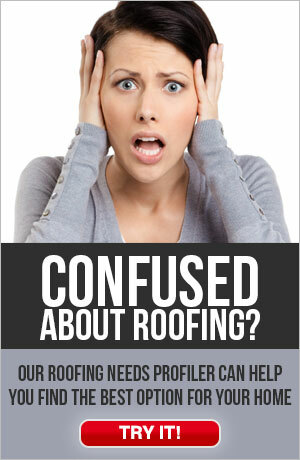 It is not recommended as a roofing application in the United States. Coil Coating – is the continuous process in which paint is applied to both sides of a moving strip of metal. The process usually includes cleaning, chemical pre-treatment, primer, and topcoat. Cold Roof – is a roof incorporating “above sheathing ventilation” in order to help prevent hot spots on the roof and subsequent wintertime ice dams. Cool Roofing – are roofs that have high reflectivity achieved either through light colors or reflective pigments. Cool roofing can also refer to roof systems which have integral ventilation to help carry heat away from the structure and reduce cooling loads. Condensation – occurs when warm moist air hits a cool surface. This can occur in or on poorly designed roof assemblies. Ventilation, insulation, and vapor barriers are the keys to avoiding condensation in roof systems. Course – is a row of metal shingles running the length of the roof. Cricket – is a peaked “saddle” constructed at the back of a chimney to prevent accumulation of snow and ice and to deflect water around the chimney. Decking – is the surface installed over the supporting framing members to which the roofing is applied. Dormer – is a framed window unit projecting through the sloping plane of a roof. Drip Edge – is a piece of metal placed on the eave of a roof to protect the underlayment and eave of the roof and direct water in the proper direction, often into the gutter or eaves trough. In some instances a Drip Edge and starter strip can be incorporated in the same component. Eave – is the very edge of the roof at the bottom (downhill) of a roof plane. Fascia – caps the perimeter of the gables and eaves of the roof, can then be used to hang gutters along the eaves. Flashings – are components used to help waterproof the perimeters and protrusions in a roofing system. Gable – is the edge of the roof that runs from the eave to the ridge; some within the industry also refer to this as the Rake. Galvalume steel – is carbon steel with a protective alloy consisting primarily of aluminum on both sides of the steel. AZ50 grade is suggested for painted product while AZ55 is suggested for product with clear acrylic coating. Galvanized steel – is carbon steel with a protective alloy consisting primarily of zinc on both sides of the steel. Various grades are available based upon the thickness of the coating. G90 is suggested for residential applications. Heat Tape – is an electric cable used to help melt snow near the eaves of the roof. This is used to help alleviate ice damning. Hip – is the inclined external angle formed by the intersection of two sloping roof planes. Runs from the ridge to the eaves. Hip Roof – is a type of roof containing sloping planes on each side. Hot Roof – is a completely sealed, not vented attic, the entire interior of which is often sprayed with closed cell urethane foam insulation. This can also be a conditioned space. Ice and Water Shield – is a self-adhering membrane, specifically designed to be used in heavy rain and snow areas where leaks can be a problem. In most cases you would install ice and water shield on the first three feet of the roof in addition to underlayment. Building codes will require this in certain areas. Ice Dam – is when snow melts on an upper section of a roof surface and then refreezes at the eaves where the roof surface is colder. This causes water to back up, causing leaks into the roofing system. Ice damming is controlled through attic insulation and ventilation. Metal Construction Association (MCA) Certification Program – MCA is the authority trade association for metal roofing and other metal construction products. Their Certification Program recognizes products that meet certain quality levels and standards for residential application. Open Valley – is a valley design used to transition water and debris off of a roof slope, carrying the water on top of the roofing systems. These valley systems are designed to not clog with debris such as tree leaves and needles, ice, or snow. Pitch – is the slope of the roof plane, referred to as the height of rise over length of run, ie: 3:12. Steep slope refers to any pitch great than 3:12 and very low slope refers to any pitch less than 1.5:12. Most metal roofs can be installed on roof pitches of 4:12 or greater though many systems can be installed on shallower roofs. Pipe Jacks – are also called “pipe flashings” and refer to metal and/or neoprene flashings used to seal around plumbing pipes, round vents, conduits, and other roof penetrations. Ridge – is the very top section of the roof running the length of the roof, where the two roof slopes come together. Ridge or Hip Caps – are accessories used to cover the inclined external angle formed by the intersection of two sloping roof planes, either at the ridge or hip. Ridge Vent – is an outtake vent for air integrated into the ridge flashing. A ridge vent’s proper performance requires intake adequate intake vents, usually in the eave soffits of the home. For most homes this is the most effective method for siphoning air out of the attic or other air space. Sealant – is used most commonly to act as a sealant of joints or cracks to help prevent leaks. The higher grade sealants are usually butyl or polyether chemistry. Sealants should be used for aesthetic reasons as well as for redundant lines of defense against water intrusion. They should never be the sole line of defense. Also, sealants are not designed to be adhesives. Snow Guards – are used in snow country to help break apart snow so it does not leave the roof surface in large pieces and harm people or property. An enhanced variation of these consists of Snow Fences. On standing seam roofs, these items need to be installed in a way that does not impede movement of the roofing system with thermal expansion and contraction. Square – refers to enough product to cover approximately 100 square feet of the roof. Starter Strip – is used to begin the attachment of many metal roofing systems. It is used at the eave (bottom) of the roof on many metal shingle systems and on the left hand edge of the roof on many standing seam systems. Step Flashing – is a method of flashing commonly used with standard roofing shingles and some other materials. Step flashing is generally not advised with metal roofing which usually uses continuous lineal flashings for greater life and watertightness. Structural Roofing – refers to metal roofing that provides structural integrity to the building and does not require decking for installation. Generally these systems are not advised for residential application because a lack of decking can be a contributing factor to condensation issues. UL-2218 Impact Resistance Rating – is a test criteria for measuring the impact resistance of roofing materials, this rates roofing materials on a scale from I to IV with IV being products that best withstand the impact test. 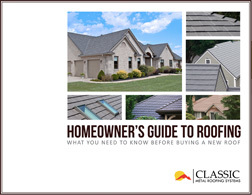 Insurance discounts area available to homeowners in some areas who choose Class IV roofs. Homeowners are advised to investigate any future limitations which accepting the discount may place on their insurance coverage. Underlayment – is 30 lb felt or synthetic sheet installed on the roof deck below the roofing material. This is required by code beneath all metal roofs, even if the old shingles are left in place. Valley – is the internal angle formed by the intersection of two sloping roof planes to provide water runoff. Refer to the glossary terms for Closed and Open Valley.